Comfy Casual Condo on the beach! Mom's Place is located on the sixth floor at Mainsail Condominiums, well maintained, 24 hour gated security complex. You will find all you need and more for your time away! You can choose to do as little or as much as you please while at our home away from home. 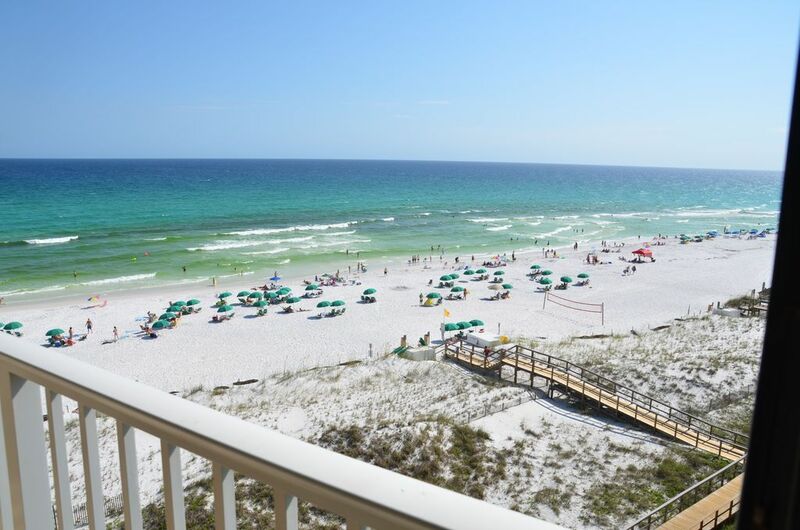 Relax on the balcony overlooking the sugar white sands of the gulf or enjoy all the area has to offer in golf courses, deep sea fishing, para sailing, boating, paddle boarding, shopping or enjoying many local restaurants. Our family has been enjoying Mainsail since i was a kid! My mom and dad bought the property in 1986 and my sister and I inherited it in 2001. We are committed to helping others enjoy all that Mainsail has to offer and are thankful for all the memories our family has from vacationing at Mainsail. Mainsail is a family friendly property that offers a safe, comfortable and relaxed atmosphere for a great family vacation! The smallish size of the complex insures you will not have to fight the crowds at the beach! Close enough to keep busy, but quiet enough to just relax and enjoy the waves! sugar white sands of Destin! sit six at the table and four at the bar! Mainsail has a game room complete with pinball and video games! Nice well maintained but needs a bit of work. Great place. Liked the location. Overall nice condo. Need to address water pressure for showers. Very weak. Second time staying here and never disappointed. Close to the beach and great view. Condo unit just perfect size for my daughter and I. Lots of extra provided, however need to leave a dish drying towel and a washing dish cloth with a small bottle of liquid detegent as I always wash my dishes and don't use dish washer. Love the extra of getting two beach chairs. Place is always beautifully clean and inviting. Thanks again for having us as your guest in your home. Plan to return next year if not sooner. Thank you so much! I'm so glad you enjoyed your stay and I'd be happy to have you back whenever you are ready! The condo has amazing views of the beach on both the sunrise side and the sunset side. We really love our stay there. Plus the beach with its fine sand and clear waters, was perfect. The beach wasn’t crowded at all. Highly recommended place and location. It was very close to the outlet mall and places to eat. We will definitely come back. Thanks so much! I’m so glad you enjoyed your stay and we look forward to having you back to Moms Place! This place was great! Very clean and beds were comfortable. Owner was very helpful and responsive to emails. The view was awesome too, and right on the beach!!! We will be back! Thanks so much Staci! I’m so glad you enjoyed your stay. I look forward to having you back! We absolutely loved staying at this condo! Listening to the waves was perfect. I always have to sleep with a fan - but not here. We just opened the door and listened to the waves all night. The bathrooms had hair dryers like a hotel - that was awesome! Washer/dryer/dishwasher/etc was all fantastic! The furnishings were perfect, the view was amazing, there’s nothing I didn’t love; except maybe we could’ve used more towels and washcloths so we didn’t have to do laundry so much. It was seriously fantastic and worth every penny to be !right on the beach! - I will never want to stay across the road or wherever to save money. The pool and hot tub, grilling area, etc for the complex was pretty nice too. It wasn’t the absolute best I’ve ever seen but if I flew to FL for the pool that would be dumb. Haha. My 4 year old and 5 year old adored the pool though. You cannot get better than Destin/Miramar white sands. Oh and also the beach in this area is so much better than closer to main Destin harbor walk area where it is super crowded. This beach was not crowded and just seriously perfect. Thank you to the owners for everything. Also they were so easy to communicate with. And the keypad was really great instead of a key. Stop looking and book this one!! Thank you so much and I’m so glad you enjoyed your stay! I’ll be sure to pass along the comment about the towels to my housekeepers! Happy to have you back anytime! We somehow came to the Sunshine State and managed to not see a single ray of sunshine due to a tropical storm moving through! Go figure. However, besides the weather, the condo was great! Very clean, well maintained, comfortable, updated, and had everything we needed!! A grocery store is right around the corner to stock the kitchen with food. Quick easy access right down to the beach and a great West facing view off the balcony. Absolutely zero complaints about this unit. (Great couch for napping with the patio door open during a storm!!). - The only thing I would say is that if you are a younger crowd and want to go out in the evenings each night, you might stay a tad closer to Destin. It was about a $20-$30 Uber ride back and forth to Destin Harbor each night. Besides that and the unfortunate weather, it was great!! Owner is very responsive as well. We are 8 miles east of Destin at the intersection of the old hwy 98 and the new hwy 98 across the street from the Silver Sands Outlet Mall. Directly on the beach!!! No streets to cross or buildings to look around. Grocery stores, video rental, ice cream, restaurants, etc. are very convenient to Mainsail.